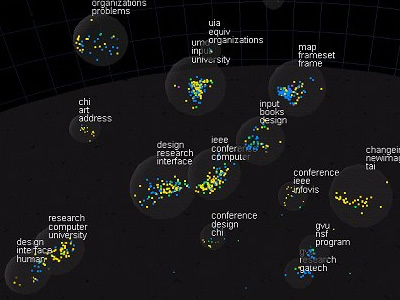 Starlight is a generic information visualization tool, developed by the Pacific Northwest National Laboratory (USA), that is applicable to a wide range of problems. In these images, Starlight is being used as an assisting tool to uncover complex file systems. 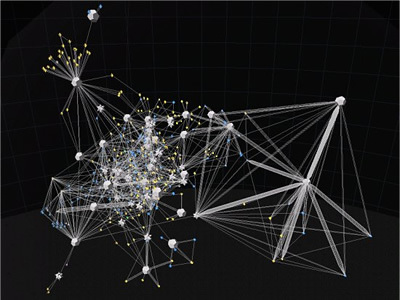 Many information resources are organized into hierarchical structures. Starlight's Hierarchy View can be used to explore the contents of extremely large categorical ontologies such as large, multipart documents, Web directories such as Yahoo, or, as shown here, large file directory structures. The images show a Hierarchy View of a typical Microsoft Windows "Program Files" directory structure that was mapped out using the Starlight DirCrawler information harvesting utility. Provided with a starting directory, DirCrawler will navigate downwards through all constituent subdirectories, collecting file and directory property information as it goes. Once this process has been completed, the application outputs an XML file that can be used as input to Starlight. The directory structure shown below contains approximately 41,000 individual files organized into about 1400 discrete directories. The individual file glyphs have been color-encoded according to file extension, with image files colored green, text documents blue, computer programming-related files (e.g. source code) orange, etc. Executable files (.exe, .dll, etc.) are shown in yellow.